VietNamNet Bridge - In June 2016, PM Nguyen Xuan Phuc ordered closures of natural forests to prevent illegal logging. The Yok Don National Park covers an area of 1,500 hectares in seven communes belonging to three districts of Buon Don, Ea Sup and Cu Jut of Dak Lak province. The buffer zone covers an area of 134,000 hectares. There are 464 plant species, including hardwood and globally endangered animal species such as elephants, tiger and red wolf. For years, the national park has been a hot spot for illegal logging and hunting, land encroachment and forest fire risks. Do Quang Tung, director of the National Park, said there were officers on 24/24 duty to protect the park. 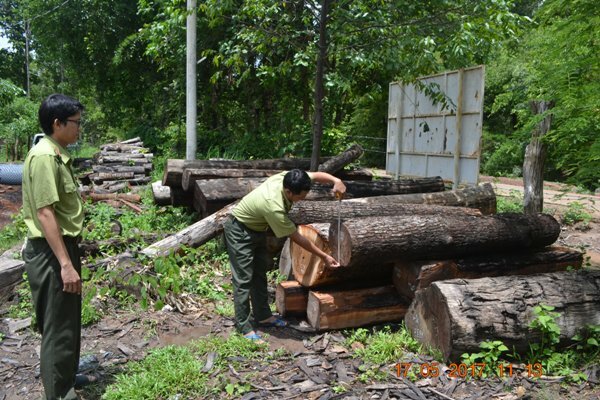 In June 2016, PM Nguyen Xuan Phuc ordered closures of natural forests to prevent illegal logging. “We have to flex our muscles to protect the forest, but human strength is limited and we don’t know how long we can do this,” he said. Closing forest has been impossible in Yok Don, because there is no real exit or entry. The forest is adjacent to residential quarters and there are large roads on which illegal loggers can use to approach the forests. Since the end of 2015, thanks to a series of measures, the forest logging fell by 30 percent. In the first quarter of 2017, forest rangers, who joined forces with agencies, discovered 88 forestry law violations, and seized 24 cubic meters of wood and forest exploitation tools. In many cases, illegal loggers even attack forest rangers to get back illegally felled wood to destroy the evidence. On April 20, when running after a truck carrying illegally logged wood, forest rangers were stopped by two motorbikes and attacked by the drivers. “We struggle hard to protect forests, but the forest has been disappearing. It really torments us,” said Y Phan Nia, a forest ranger at Yok Don National Park. “If Yok Don forest doesn’t exist anymore, the river will become dead, while the Central Highlands will turn into a stone desert,” he said. Located 30 kilometers in the northwest of Kon Tum City is Chu Mon Ray National Park, called ‘South East Asia’s heritage’. According to Nguyen Thanh Hai, deputy director of Chu Mon Ray, there are more than 2,000 plant and 620 animal species, including gayal. There are now only 100 gayals and they are under special control. One forest ranger at Chu Mon ray has to take care of 1,000 hectares of forest, which is a heavy burden for them.